When you’re in Epcot, there are so many things to see and do, you want to make the most of every second. 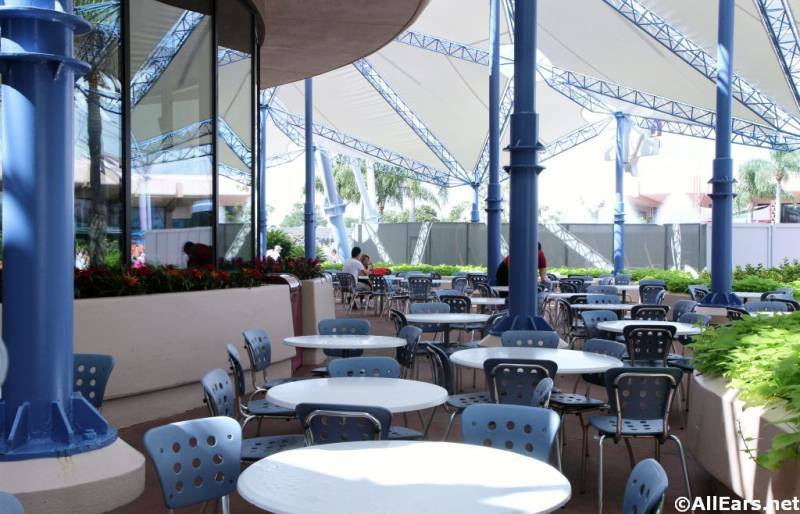 It only makes sense to save some time by dining at one of the park’s many counter-service locations. But which one? Heading into Epcot for a bite? When we think of the restaurants in this category, two come immediately to mind: Electric Umbrella and Sunshine Seasons, both in Future World. One is definitely better than the other, at least in our books. Hear us out as we walk through our reasoning. At Sunshine Seasons, you can almost always find a table. The vast dining room seats hundreds of guests at a time. There are four different areas in which you can pull up a chair or snuggle into a cozy booth. The theme of the sections corresponds to the seasons, so it’s easy to track down your friends if the party wants to split up. Just look for the pattern printed on the tables to figure out where to go. The rest of the decor might seem bland, but take a look up to see long lengths of fabric and hot air balloons. You’ll feel like you’re at a festival with the bright colors and fun artwork decorating the four aircrafts. 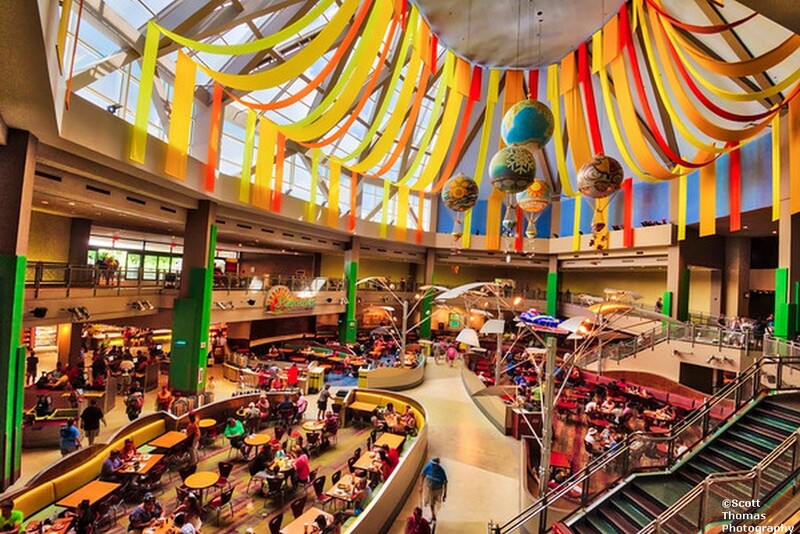 Sunshine Seasons is set up food court-style. This makes it easy to pick and choose exactly what you and your family want (or what they don’t want). There’s something for everyone to love, among the various “shops”: Asian Noodle, Grill, Sandwiches, Soups & Salads, Kids’ Zone, and Bakery. There are tons of items to grab and go, like fruit, chips, and energy bars. Don’t forget that this location even serves alcoholic beverages. My mouth waters every time I enter the Land pavilion and smell the aromas of all the tasty items cooked up at Sunshine Seasons (not to mention the nearby Garden Grill Restaurant). 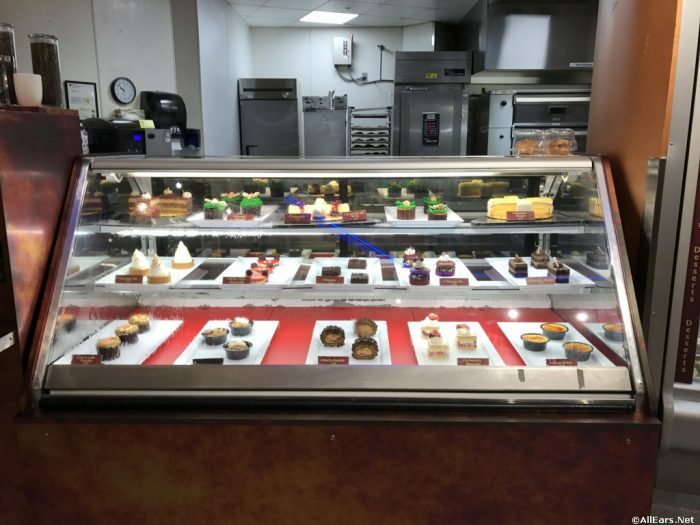 By the way, did you know that many of the items served at these locations are made with food fresh from the greenhouses seen on the Living with the Land ride? Electric Umbrella has a cool, futuristic concept that ties right in with Future World. The dark paint color on the walls makes the red umbrella decor pop. You can head upstairs for some seating under lit umbrellas in primary colors. At night, this restaurant lights up just like the name. You’ll find adequate seating here; there are also tables outdoors to enjoy. 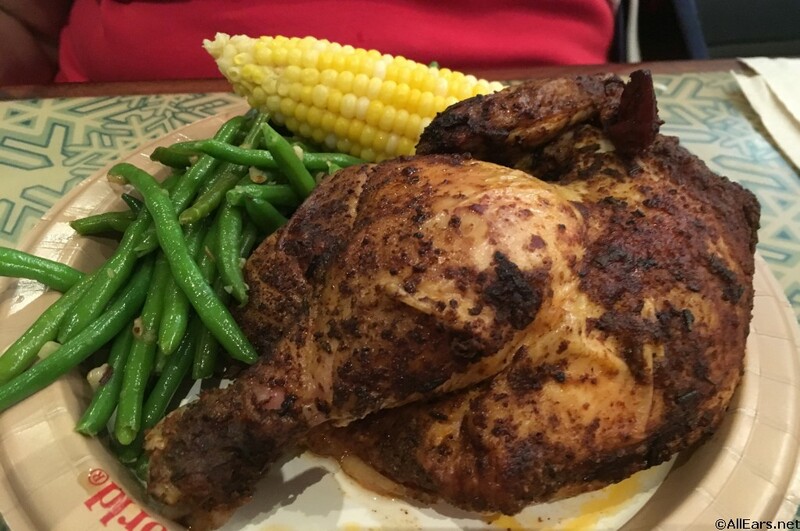 Ask a cast member for help ordering allergy-friendly options that fit your needs. 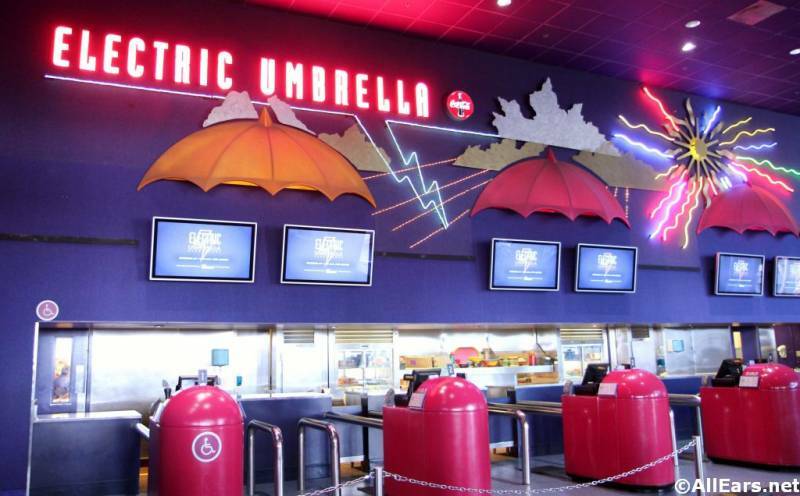 The menu at Electric Umbrella features mostly burgers, wraps, and sandwiches. You can get a healthy salad and kids’ options there as well. You can pick up a beer and even dessert, but the best thing about this menu is the allergy-friendly aspect. Whether you have a restricted diet or just a sensitivity, head over to Electric Umbrella to find gluten/wheat-free, fish/shellfish-free, egg-free, dairy-free, soy-free, and peanut/tree nut-free choices. What Do Our Reviewers Have to Say? If you take a glance through our Rate and Review section, it’s clear that guests love Sunshine Seasons. It scored an 8.3 out of 10 overall! That’s great for a counter-service location. “A good quick-service choice for a vegan. This is one of the few places that have vegan food on the menu and not make it something you have to special order. For about $15 you can get a vegan entree, drink and side dish. The place can get crowded and the noise level is high, but don’t forget where you’re at. 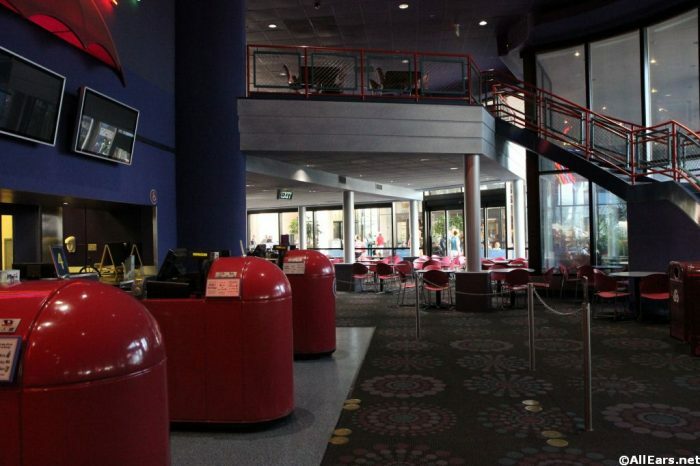 Soarin’ is right around the corner so the crowds will be there. 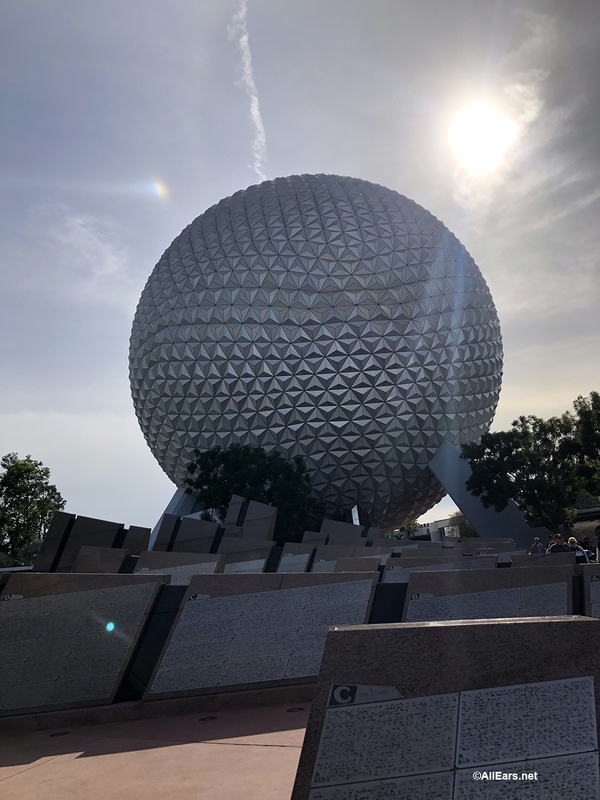 I come here every time I’m in Epcot,” says AllEars.net reviewer DeanMoriarity. Electric Umbrella only scored a 7.1 out of 10 overall from our readers. Comparatively speaking, that’s still OK for a quick-service spot. Looks like our reviewers agree with us. “You have all kinds of food here. From fries to salad. The rotisserie chicken is very good and tender. If you are not on the dining plan, an adult plate can be shared between two kids, the portion are large enough,” said reviewer Doironi. Whichever of these Epcot quick-service spots you choose, remember you can save even more time by ordering your meal in advance with the mobile order function in the My Disney Experience app! Which is YOUR favorite? Tell us in the comments below or leave a review for Sunshine Seasons or Electric Umbrella. To find out more about Sunshine Seasons, see photos and the full menu on our info page. Or follow the link to our info page for Electric Umbrella to discover more and read through the full menu there. Previous PostPrevious Order Official Personalized Shirts on shopDisney.com!